Jump lists are one of the most innovative and useful features introduced in Windows 7. Although jump list may seem to be just an extension of the My Recent Documents functionality that has been in Windows since the Windows 95 edition, they actually do much more that just display recently accessed files. Jump lists keep your most recently used things handy for easier and faster access. The options that you see in a Jump List depend entirely on the program. 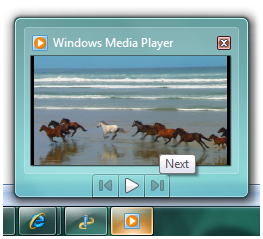 The Jump List for Windows Media Player 12 lists commonly played tunes and Internet Explorer 8 shows frequently viewed websites as shown below. 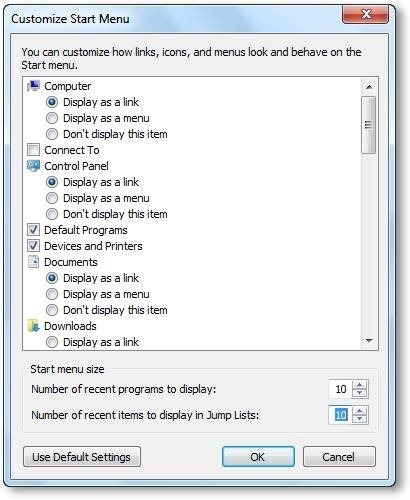 To open a jumps list, right-click on a specific program on the Windows 7 taskbar or left click on the program in taskbar, hold and drag towards center of the screen. 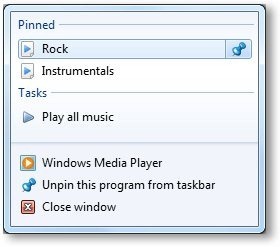 The last three options in the jump list are same for all lists – Close window, Unpin this program from taskbar and the program specific executable. Above this are the tasks that are associated with the specific program. Lets take another example of – Internet Explorer. 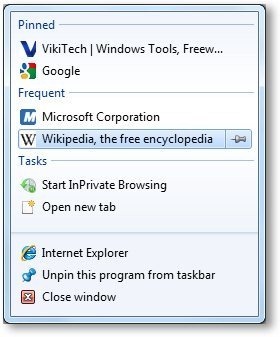 As seen in the above screenshot on the right, the Internet explorer jump list shows the frequently used and pinned websites for easy access. The jump list items are automatically refreshed to show recently used items associated with a program. You can pin/unpin any of the items or remove any item from the jump list. 1. Right-click on the taskbar and select “Properties”. 2. In the “Taskbar and Start Menu properties” dialog box, switch to Start Menu tab. 3. 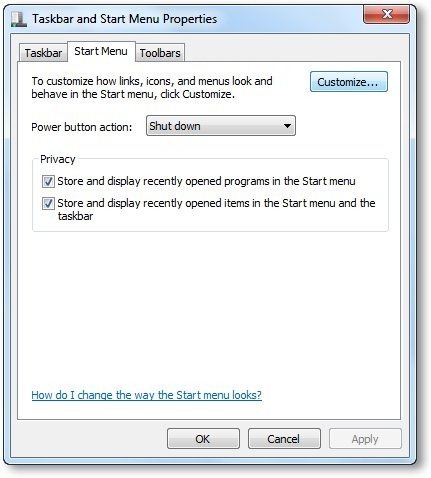 Deselect the option named “Store and display recently opened items in the Start menu and the taskbar” to disable Jump Lists feature. 5. Recheck the box to enable the same feature. 1. Follow steps 1 and 2 same as above. 2. Click on “Customize” to get the below dialog box. 3. At the bottom there is option to change the “Number of recent items to display in Jump Lists”. Set the value to any number you wish in range of 0 to 60. 4. Click on the “OK” and “Apply” button to save the changes. Jump List is one of the interesting features that separate Windows 7 from its predecessors by proving quick and easy access to your recently used items. These minor tips would add up to improve your Windows 7 efficiency and contribute to a better experience. Hopefully some of you would find this useful.